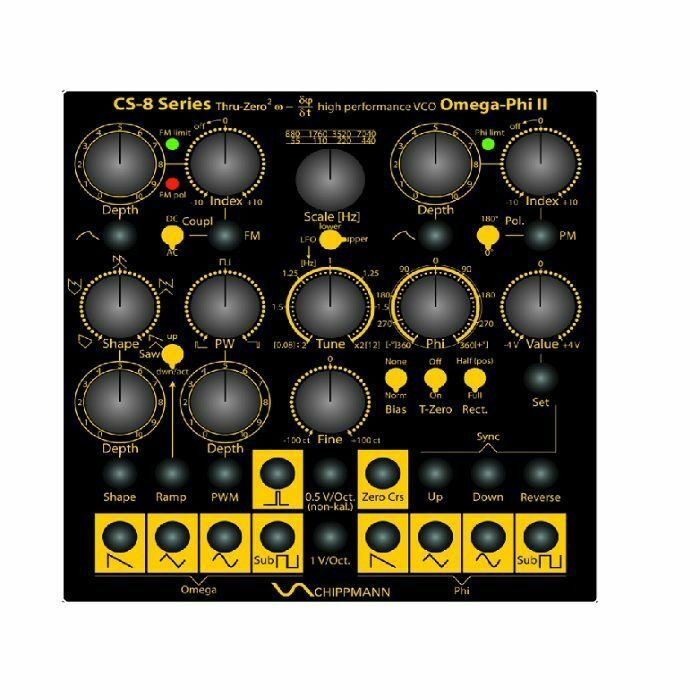 SCHIPPMANN Schippmann CS8 Omega Phi II VCO Module vinyl at Juno Records. Lines open in 11 hrs 12 mins. Improved version of the high performance Thru-Zero Oscillator OMEGA-PHI. - Parasitic noise effect especially audible at low oscillator frequencies at the Omega-sine/tri outputs exactly when the thru-zero operation begins to start by FM-modulation through a sine modulator is reduced by 15 db and is so no longer audible! BTW: a similar noise at the Phi-sine/tri outputs was not reduced! a) New precision rectifier design leading to terrific in-tune FM synthesis over the full index over a very wide frequency range. b) New core-symmetry circuit for a perfect balanced triangle wave eliminates tendencies to asymmetric tri/sine shapes even at high FM-modulation frequency/carrier frequency ratios. This leads to no more carrier-sine distortions and no detunes even at high ratios. c) Improved thermal board design for better frequency stability and linearity at very high frequencies and thus more stable FM results, generally. - Extended maximum FM index from 44 to now 50. - Completely new VCA design for FM and PM providing ultra-low noise and ultra-low control feed-through capability. - Ultra low constant or transient frequency shifts with varying FM indices in both modes, DC and AC. - Cleaner sound, especially for PM and also for FM at higher oscillator frequencies, where VCA noises become relevant. - Smoother VCA-index curve for better control even around zero reduced potentiometer noises for PM Phi (-360- - +360-).